What up people. 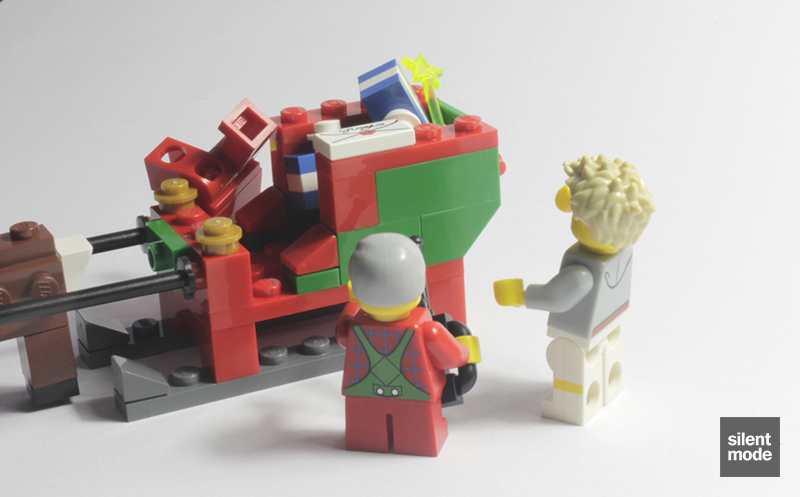 It’s going to be my fourth Christmas as an AFOL, and what better way to celebrate the occasion almost two months early than with a Christmas-themed review of another seasonal polybag set. I used to lament the fact that people in my neck of the woods sold themselves out by calling Father Christmas Santa, like they do in the States. When was the last time you’d ever heard anyone referring to Father Christmas? Just like Decorating the Tree, this polybag has a striking dark blue background to distinguish it from the others. The contents of the set pretty much speaks for itself. 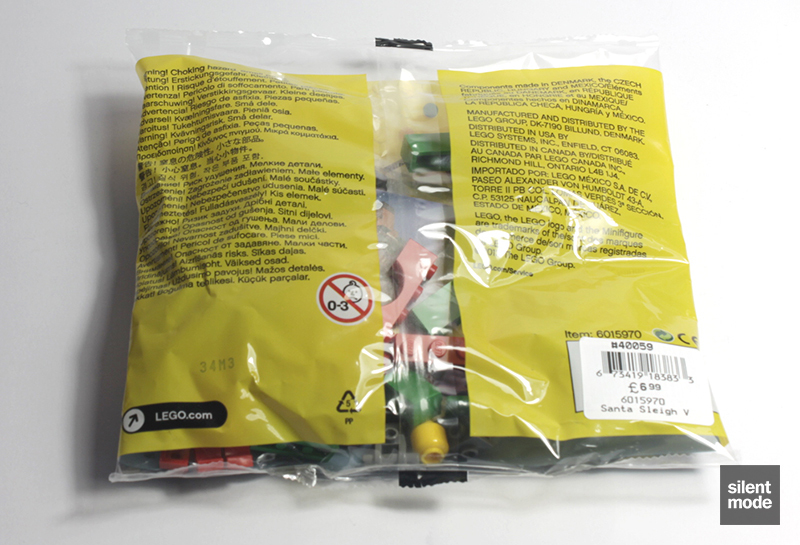 The back of this polybag is also missing the highlighted warning box on the bottom left, so you can use the half an hour saved from having to read the 926 languages to spend with your loved ones. From the outset we’d expect to see a lot of Red in this set, but opening the package reveals not a lot of parts at all. Perhaps most noticeable in this collection of parts is the two Technic skis in Black, a droid body in Dark Stone Grey, and two “dalek” SNOT bricks in Dark Stone Grey. 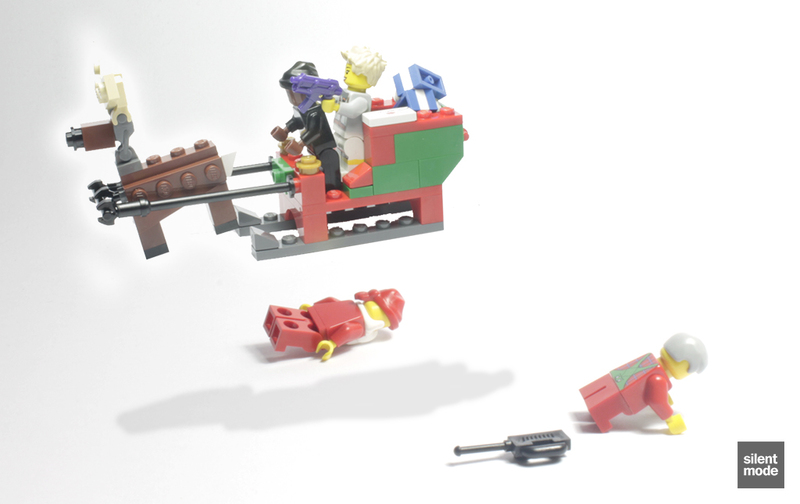 Once again we’re having to deal with Red legs for both minifigures. The smaller bag contains familiar parts, including another couple of magic wands and an assortment of 1×1 plates, both square and round. Unless you’re into microscale building, the 1×4 rod in Black (middle) is probably going to be the most useful part in this photo. Here we have Santa and what appears to be a basic elf helper. I guess this is the best they could do if they were unable to use Collectible Minifigure parts (but explain what the pie and ship in a bottle were doing in Thanksgiving Feast in that case), but you may recognise this particular Santa design from the infamous Holiday Set 2 of 2, albeit with a slightly less glamorous base head. The helper looks very odd, in that he could pass for a child having short legs, but has grey hair. 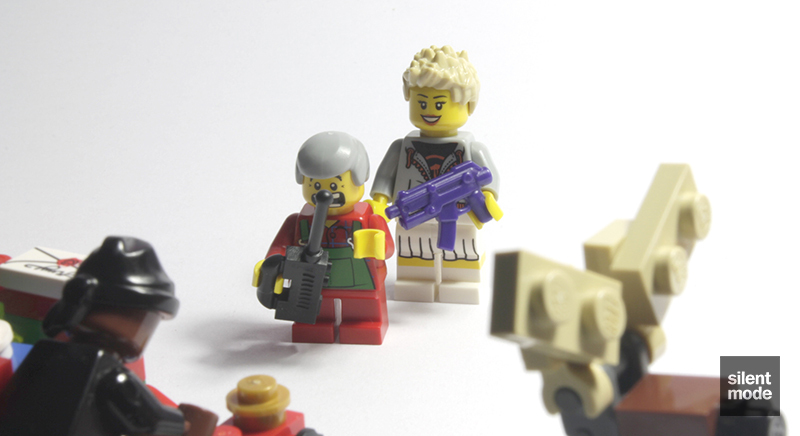 I would not be in a hurry to include this figure in any of my MOCs. The sleigh begins life as a very simple base, created using a couple of red arches and some plates. Two Dark Stone Grey cheese slopes provide the “lip” at the front of each ski. 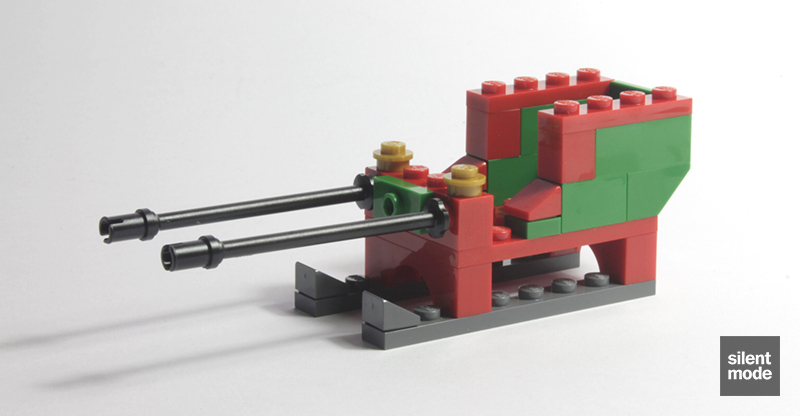 The walls of the sleigh are built up using our Green bricks, with the Red elements providing a trim. 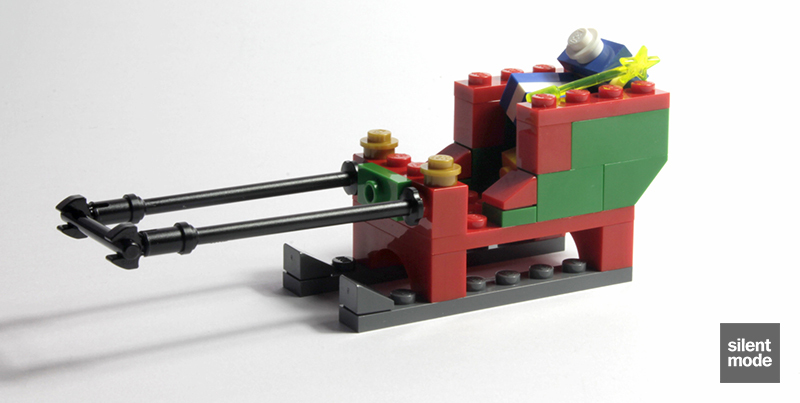 The finished sleigh should look like this, complete with both Technic skis pointing out to act as a harness for the reindeer. We’re not quite done yet! After loading the sleigh with a bunch of presents, and attaching a bar to the front of the harness, we’re ready to get this thing moving. I made that bit up, but this reindeer looks every bit as robotic as the premise suggests. Normally Santa would have a team of twelve(?) reindeer pulling his sleigh, but he’s gotten with the times and hooked it up to a single anti-gravity device in the shape of his most useful animal friends. It’s difficult to imagine how a reindeer could be built using the remaining parts, but once again whomever designed this set has surprised us. It’s very much possible using a basic SNOT technique, and a very clever way of creating a neck and head using the droid body. 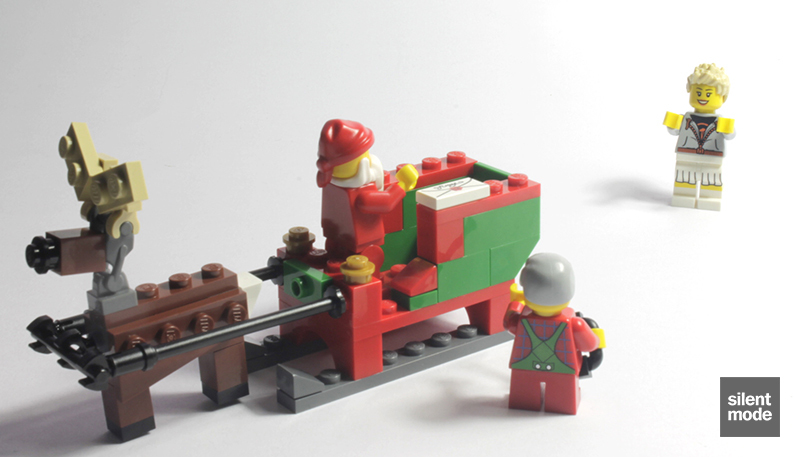 Once the reindeer is attached to the harness, with the help of the clip inserted into the front, Santa is ready to take flight on his modern sleigh (in functionality at least). At the last minute he’s given a letter from a concerned and doting mother to take to a sick child in Great Ormond Street hospital. A nice selection of leftover parts are yours to add to your spares. The 1×1 plates in these colours will come in useful: though they’re common you can never have too many of them to hand. It may not be much to look at from the packaging, or if you’ve seen it built in store, but it is actually a nice looking set. I’m very impressed with the way the reindeer was designed and built, and the method of attaching it to the sleigh isn’t bad either. I could see someone making a very impressive sleigh using twelve of these reindeer, but how to attach them all is going to be a bit of a challenge. I am rather disappointed that Santa’s design hasn’t improved from Holiday Set 2 of 2, given that we’ve seen new beard, torso and hat parts for the character. It would have been cool to even use an alternative design, such as reintroducing Father Christmas’ green cape, or perhaps giving us a Santa from a different culture. We can always exchange this one with S7 Santa if we have one, complete with sack, I guess. Speaking of exchanging, hopefully you have a Holiday Elf from S11 as well; it’s a far better candidate than the helper supplied in this set. They could at least have given him Green mini legs to match his torso! Although adding gifts to the sleigh could be more organised, the sleigh design is simple but effective - and I really like that reindeer. 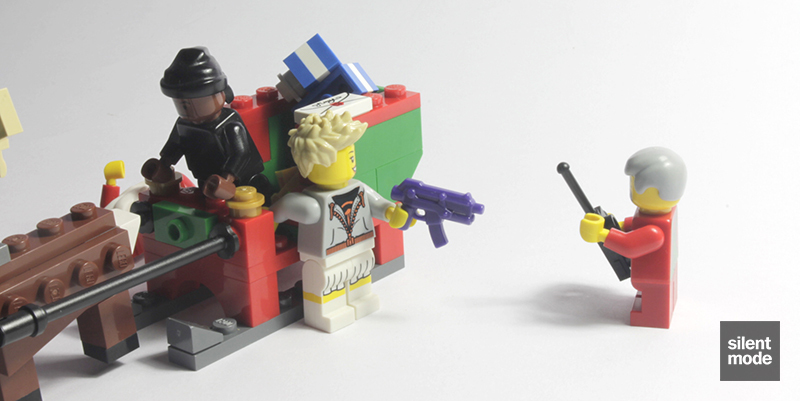 Both minifigures let the set down. 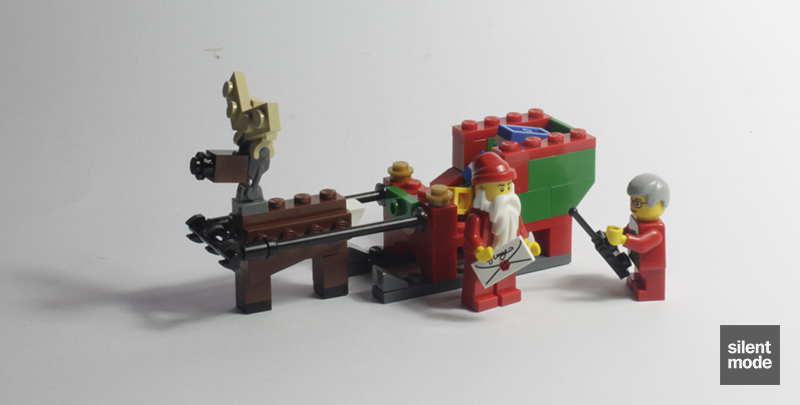 Building the reindeer from a seemingly impossible selection of parts was the highlight of the set. Nothing spectacular, although the droid body and the SNOT bricks in Light Stone Grey came as a pleasant surprise. 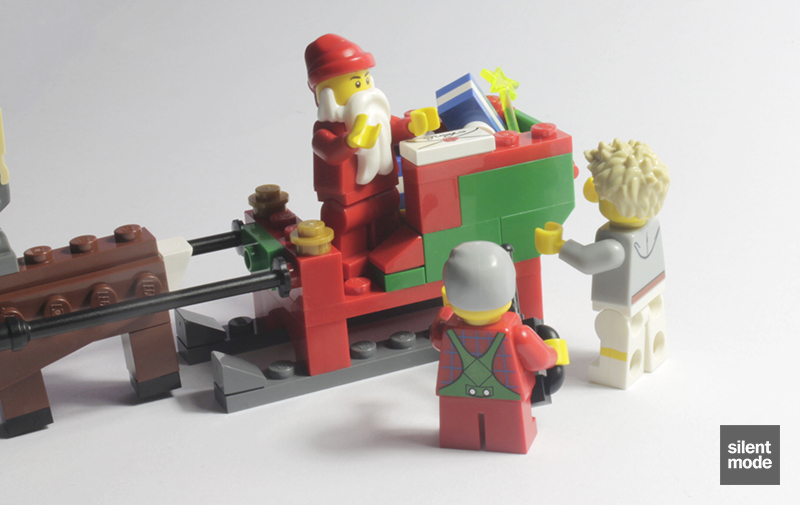 Without having to worry about the gifts falling out, the sleigh has a good swooshability factor, even if we imagine the reindeer to be mechanical. It's worth picking one up, but it may be a better idea to source the individual parts elsewhere if you plan on building more reindeer. So before we get to the good part of this review, it’s my duty to inform you that this set gets an official 6.8/10 from me. 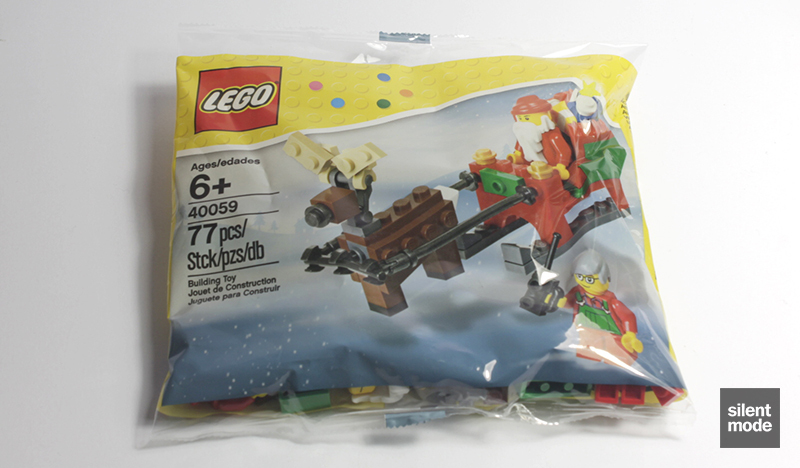 It’s one of the better seasonal polybag sets I’ve reviewed.